Paul Elliott scored the only goal as Littlehampton Town saw off rivals Wick in a fiery Peter Bentley Cup tie at The Sportsfield last night. 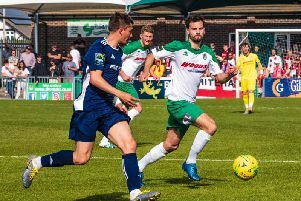 Forward Elliott finally broke his duck for the club after joining in the summer three minutes from the end as nine-man Golds were 1-0 winners in the second-round encounter. Littlehampton had both striker Alex Fair and Mitchell Hand – making his first appearance since returning to the club earlier in the week – sent off. Fair was dismissed with the scores still level before substitute Hand received his marching orders in the aftermath of what turned out to be the winner from Elliott. Golds boss Nigel Geary described his team’s performance as ‘awful’ and was less than impressed with the match officials. He said: “We didn’t perform anywhere near the level I know we can but we won a derby game. “It’s not ideal when you’ve got players coming from all over Sussex for an evening match, but we got the goal and won the game. “Our passing was off and we were just well below the levels we’ve shown at times this season. “I felt Alex should only have been booked for the incident in which he was sent off. “Mitch was then shown a harsh red card in my opinion, which left us with nine players for the final few minutes. “It’s one we’ll look to move on from. “But, even though we won the game, I’ve come away frustrated. I’ve now lost two important players for the next three games. Golds came into the game on the back of a defeat to Selsey while Wick sealed an impressive FA Vase success last time out. The first half was not the greatest spectacle, with very few chances being created by either side. Fair was shown two yellow cards and given his marching orders soon after the restart. Despite being a man light, Golds got the opener through Elliott three minutes from time. He superbly took a pass in his stride and slotted home his first for the club. Substitute Hand, back at Golds after a short spell with Pagham, was then dismissed following an incident in the aftermath of the goal. Littlehampton had to see it out with nine men but managed to do so. Golds reached round three while Wick were left to rue what they must see as a missed opportunity against their big rivals. Wick joint boss Lee Baldwin wants his side to show more cutting edge after exiting the cup. He said: “We were disappointed to have lost at the end. We controlled the majority of the game and just lacked the killer instinct in front of goal. Both are in SCFL Division 1 action on Saturday, Golds make the trip to Storrington while Wick visit Midhurst.